Bullet magnet totally encased in stainless steel. 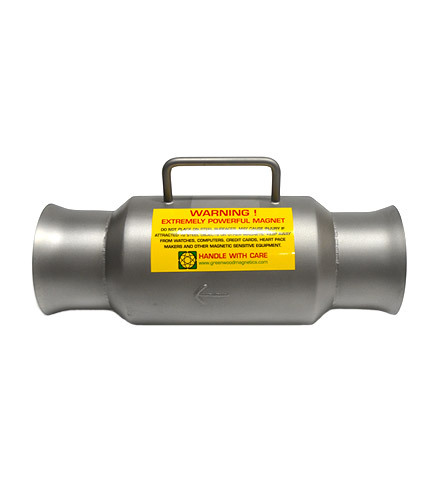 Door closed and door open showing "bullet magnet"
The Greenwood Permanent Magnetic Bullet Separator is a compact, efficient in-line magnetic separator for extracting ferrous metal contamination from either gravity fed or pneumatic pipelines. 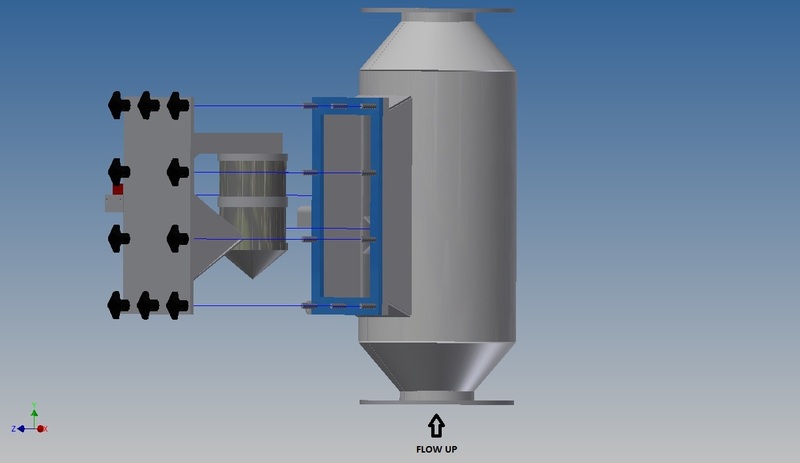 It is normally fitted into pneumatic process lines, often for food powders, and intake lines with high velocity where abrasive products (such as wheat) can present a problem. 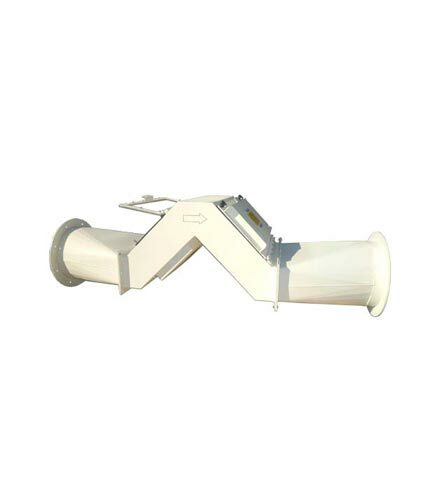 The magnets are positioned in such a way as to give good access, as they need to be cleaned regularly. To clean the magnet, the star knobs are unbolted and the door with the magnet removed from the housing. For faster access we also offer the clients the choice of quick release swing bolts. On larger applications where the pressure is low (or gravity fed) the magnet is attached to a round door which swings out. The magnet is then cleaned manually and replaced. For flour lines with iron additive, we recommend a maximum strength of 7000 gauss so that the iron additive is not removed from the product. 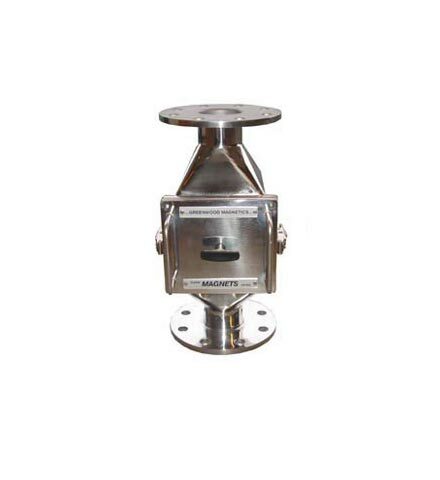 The separator is manufactured from stainless steel, and the dry, free-flowing product flows through the body and over the bullet magnet which extracts the contamination. 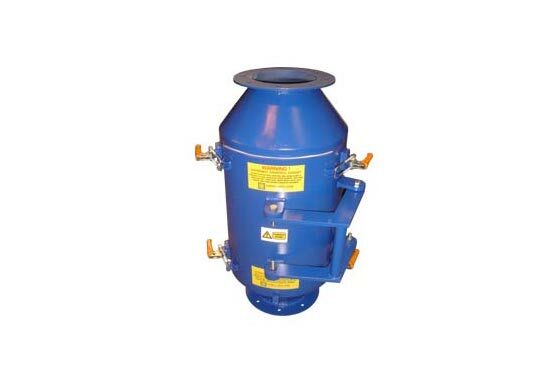 The magnetic separators can be horizontal as well as vertical, the flow being up or down. 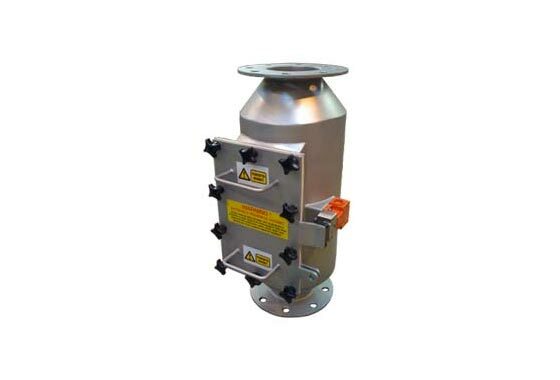 Internal deflectors ensure that the product is diverted over the bullet magnet with minimal turbulence and no blockage. In terms of supplying a bullet magnet separator, we first consult with the client to determine specifications such as the size of the line, the pressure in the line, the size of the product, the temperature, and tonnes / hour. Then we supply drawings to suit their applications for approval prior to manufacture. 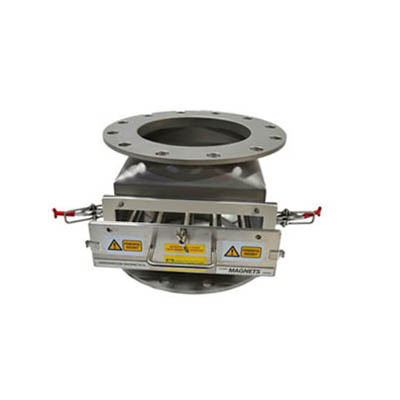 A good example of an application of this technology is a large rare earth bullet magnet, for a 250mm diameter line, rated at a very powerful 15000 gauss, produced for an animal feed ingredient manufacturer. They produce meal powder for the pet food industry. A lot of the raw material (bones, etc.) 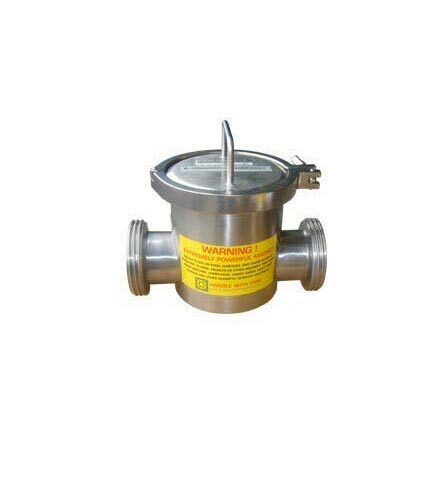 is ground to produce the powder, and inevitably this creates ferrous metal fines (very small particles) in the product, which are caught by the bullet magnet. 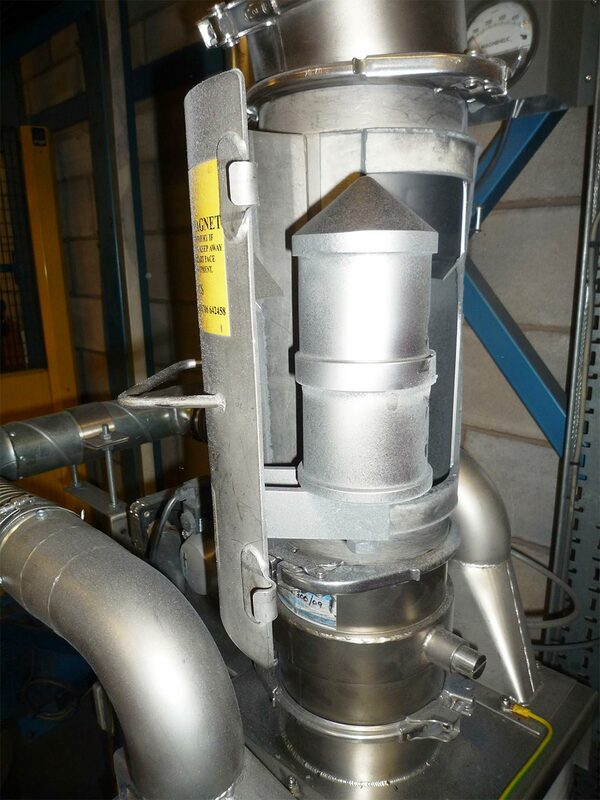 Since the separator has been installed the company have found very little carry over of metal fines further down the process, thus improving their product, and streamlining their production to make it more efficient. 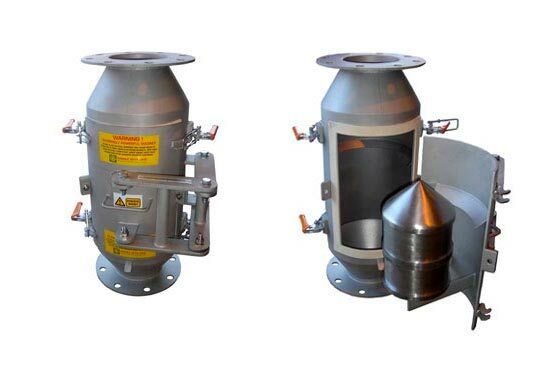 The bullet magnet has applications in food processing and powder handling, as well as in both wood and plastics recycling. "4" bullet for food application. Flat door bolted design for pressurised line. 200mm dia. bullet for wood shredding application. Mild steel, painted to customers colour. A 10000 gauss bullet magnet filters fine contamination from high value thermoplastic powder prior to packing.